This first cards uses all SU products. This next card uses stamps from Flourishes - I just love the Flourished Words Set, and the Flower is from Fantasy Floral Garden. The DSP you see is from SU's new DSP, Bali Breeze. Flourishes has just released some great new sets - be sure to check them out! 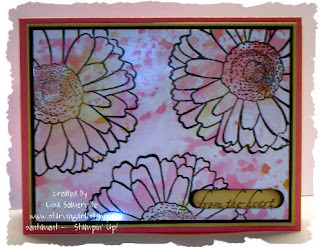 The last card I have to show you uses the Artful Inkables Blossoms & Petals and the sentiment from SU's Hugs & Wishes. To create the BG, I pressed glossy card stock to my Marker Wash card shown here, then let it dry, and stamped my images in basic brown ink. If you'd like to join this weeks challenge and create a sympathy card - be sure to leave a link in this post, so I can check it out! Lisa, these are all lovely cards! I especially love the first photograph. They are all great cards, Lisa!!! It seems I am always needing, and making, sympathy cards. 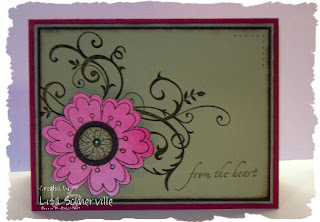 The Flourishes card is just lovely -- great use of the Flourished Words and floral images!!! Love them all as usual. These are all wonderful Lisa. Sympathy cards are the hardest ones to create...for me at least. You did a fabulous job! I love all your cards, Lisa...just beautiful! Every card is so different. I esp. love the colors on the first one..very eye-popping. Great cards, ALL of them! Beautiful cards! You did a wonderful job! All 3 cards are beautiful. I really like the background in the last one. Gorgeous! What perfect samples - each appropriate for those times when we need to reach out to someone who is grieving. Lisa! I was going to try and pick a favorite but I guess it'll have to be all of them! They are all beautiful and so fitting! Beautiful cards Lisa. 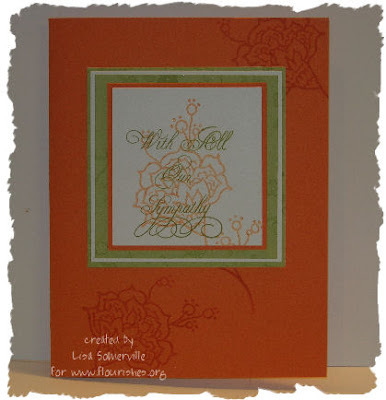 I love the simplicity of the Stampin' Up! card. very nice on all of them Lisa. definitely not cards I make often and when I do it is never easy. wow, that first card really stands out to me - and also inspires me to get that flower set put together and used already! lol Beautiful work, as usual. fellow TJ'er here! I really LOVE the first card - especially the center of the flower. Great card! Lovely--all very different, but perfect for sympathy cards.